There is the third column indicating a "Hands On Lab". Depending on how things work, I will definitely want to swing in there to check it out. 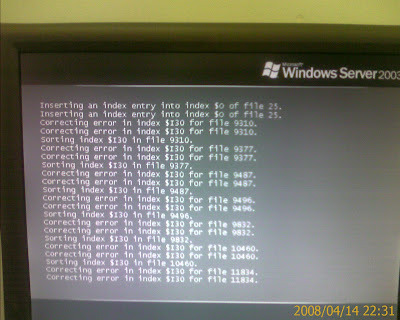 Run 'slui.exe 0x2a 0x8007232B' to display the error text. That error has been encountered before. 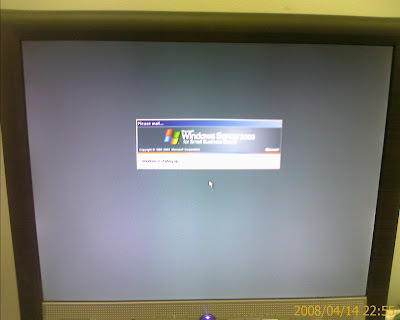 The error was encountered when we went to activate our Open Licensing version of Windows Vista: Windows Vista - Activation Error: Code 0x8007232b DNS Name does not exist. In the case of Windows Vista, it was because we installed Vista without a product key. Well, when installing Server Core, no product key was requested and we are not using the unattend file to install yet. So, the challenge now becomes, how do we get that key in there and activate the product? A little searching was required in order to find the right command line commands. We found them on Sander Berkouwer's blog "The things that are better left unspoken" Activating Server Core. This process will also switch the Activation process from KMS to MAK which is the preferential activation method for us. The Server Core command line sure is both refreshing and challenging at the same time. It brings back memories of the challenges of doing things like setting up the AutoExec.bat file for memory management to squeeze the most conventional memory we could (my personal record was 614KB) to get those games up and running. Resources for Server Core are out there, but are still rather spotty due to the newness of the OS. We have one book on the subject so far, which is in the process of being read and evaluated. 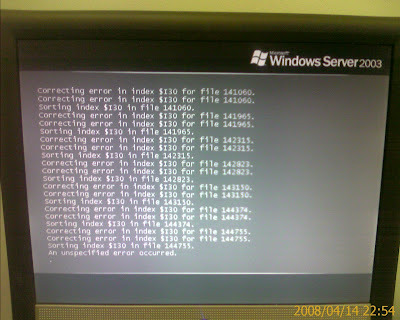 Server Core is definitely a neat OS option in Server 2008! And, it is looking like the same VMs that ran on W2K3 R2 hosting Virtual Server 2005 R2 SP1 are a lot faster on similar equipment in Hyper-V installed on Server Core. Having the option to specify the number of cores per VM is a pretty neat feature and can be very handy for things like hosting server OSs. When it came to setting up Virtual Server 2005 to allow VMs to access ISOs across the network, one needed to go through and setup constrained delegation on all of the systems running Virtual Server and the server hosting the ISO's shared folders. 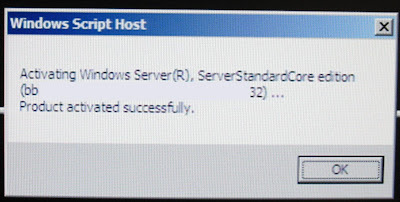 Unfortunately, the error in Hyper-V when trying to mount the network located XP Service Pack 3 erred out with a "General Access Denied" message. We tried the constrained delegation setup with the new Server Core system and that did not work. This InfoWorld article provided a clue to how we needed to give our VMs on Server Core ISO access on our network: Next-gen virtualization from Microsoft. For Hyper-V, network access for things like ISOs are simplified somewhat as one need only add the computer Hyper-V is installed on to the shared folder's permissions with read/write access. Once this is done, we were able to mount the service pack ISO with no difficulties. This eliminated the need to copy the ISO over to the host machine. During the first phase of the SBS setup, there is a point right around 34 minutes where the USB ports are knocked out. That is also right around the time that the Intel SRCSASRB RAID card drivers will have a WHQL warning pop-up message that one will need to acknowledge. If there is only a USB keyboard and mouse installed on the server, one will not be able to click on the Continue button. One will need to reset the server and plug in a PS/2 keyboard or mouse to get to the pop-up window. Once the pop-up driver windows have been acknowledged, the setup can proceed without the need for any further input via a PS/2 keyboard. This situation is one reason to keep a PS/2 keyboard around besides the need for one on KVMs. We have mentioned in the past how one can utilize Virtual PC 2007 based Server 2003 VMs to facilitate a smooth SBS Swing Migration. 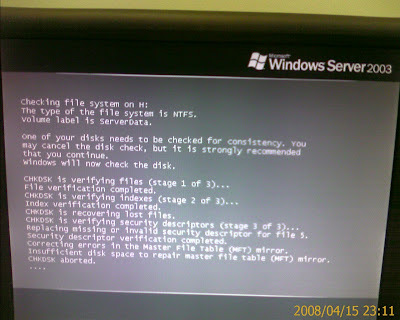 Using a Windows Server 2003 R2 VM setup can streamline the steps. One can have a W2K3 SP2/R2 base VM install that can be used to copy from and start a new VM instance for the Swing Migration. The SP2 install can be used in the case where the SBS 2K3 Active Directory has not been extended for the new Server 2003 R2 components. 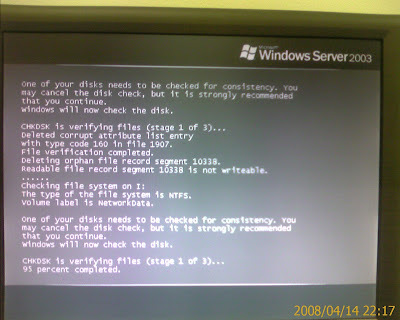 One of the significant benefits to using a Server 2003 VM in the Swing process is the ability to both enable Undo Disks and also to Save State and subsequently copy the VM VHDs after each phase of the Swing. This is a great way for someone who is new to the whole process to get comfortable with running through the Swing steps and not have to worry about starting from Ground Zero if they make a mistake. Having the saved VMs also gives us the ability to go back to them and run through the various server components to see the how and where things were modified and/or deleted. The same is true for those who are Swinging SBS for a client's production domain environment. 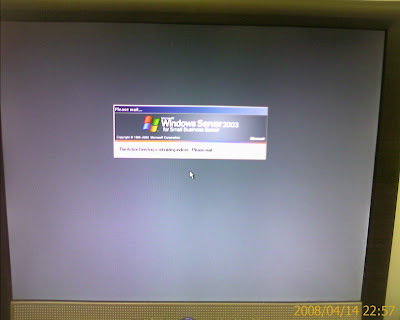 Having that Server 2003 VM can be a huge time saver if something hiccups or dies during the Swing process or during the final phase of the SBS setup post-Swing. Note that when we are working with client's SBS production domains, we always create a ShadowProtect image of any of the servers needed for the Swing before we start. This gives us a quick fall back if things don't work out as we expect. We also tend to take a quick ShadowProtect image of the new SBS install at the various Swing stages to make sure that we do have a fallback in case things hiccup or blow up. We use one of our Vista lab systems running VPC 2007. Besides the DQ35JOE's on board Gigabit adapter, the system has a low profile Intel PRO/1000 PT Dual Port (EXPI9402PT) server adapter installed as our lab systems are setup in the Antec Minuet chassis. The JOE's on board NIC is connected to our internal network, and one of the Intel PT's ports is connected to a stand alone dedicated Gigabit switch that the old SBS and new SBS servers will also connect to depending on which stage we are at in the Swing Migration. 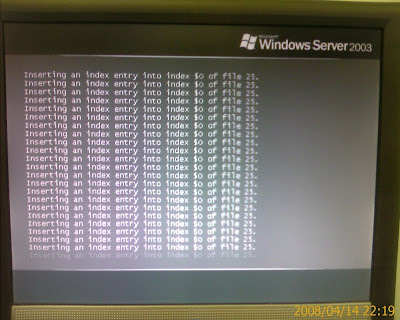 The Windows Server 2003 Virtual Machine setup has helped us out during the Swing process on countless occasions. This is a revision of the original post: SBS 2K3 R2 - Setup steps and resources. It has been updated to include some new functionality as well as some available feature additions that can be installed during the various stages of the setup. After the final SBS reboot, enter the Domain Admin account into the DHCP Manager's properties. OPTION: Install Access Based Enumeration for greater folder security. Enable ABE by share as opposed to globally. OPTION: Revise your user template Quotas as appropriate by right clicking your data drive --> Properties --> Quota --> Quota Entries and change the template volume. OPTION: Download and install .NET 2.0 in preparation for SyncToy. OPTION: Download and install the Microsoft copy utility: SyncToy 1.4. The CEICW will fail on the initial ISA install. ISA SP2 or later will fix that. Note that during the ISA CEICW one will need to recheck any extra settings at the Web Services Configuration step as it tends to pull them back. Install IE7 for Windows Server 2003 (download link). Enable Exchange settings: "Display routing groups" and "Display administrative groups" by righ clicking on the Exchange "First Organization" --> Properties and tick both. Apply & OK. If there are no pre-Exchange 2000 servers on the domain switch to "Native Mode" while in the above Properties. Look at the client email Mailbox size limits. We tend to set the limit to 1GB out of the box. Under Advanced Management: MySBSDomain (Exchange) --> Administrative Groups --> first administrative group --> Servers --> MySBSServer -->First Storage Group --> Right click Mailbox Store (MySBSServer) and Properties --> Limits Tab. Impliment Recipient Filtering to protect against a Reverse NDR Spam Attack (previous blog post) and avoid an SMTP Queue Length error in the inbox. Note that WSUS v2 should be synchronized before installing WSUS v3. Uncheck "Shutdown worker processes after being idle for (time in minutes)" under the Performance Tab for the DefaultAppPool in IIS. This reduces the first visit to Companyweb browser stall in the morning. 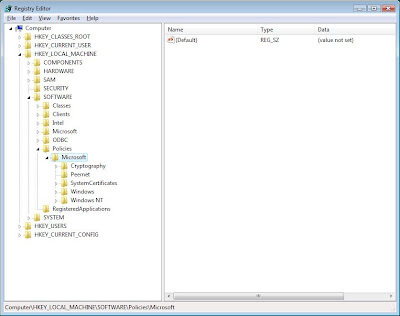 Setup any Software installs via Group Policy (previous blog post) making sure to modify the permissions on \ClientApps\. Create and setup any custom Domain or OU level Group Policy Objects. We remove a domain user's ability to remotely shutdown any system as one example. 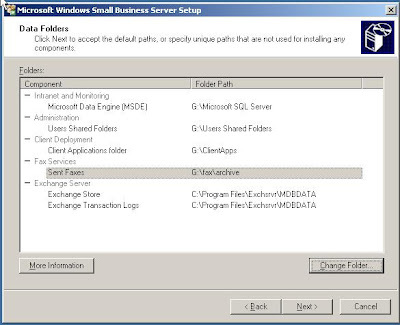 OPTION: (May not be needed if you plan to use WSS v3 as principle) Upgrade the Companyweb SharePoint MSDE instance to SQL 2005 (smallbizserver.net article) and enable Full Text Search. OPTION: Backup the server using your preferred backup method. Ours is StorageCraft's ShadowProtect. Crash the drives. Restore from backup and then deliver. 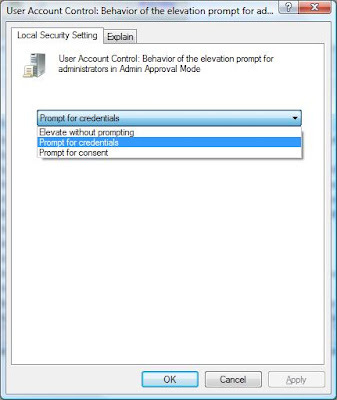 OPTION: Enable users ability to change their password while working in Outlook Web access (OWA) (previous blog post). In the case of the R2 Tech CD, verify that the Service Packs are still current before installing. If not, download and install the most current Service Pack. 2008-01-18: Added steps 4a, 4b, and 4c above to download and install the appropriate support tools. 2008-02-15: Added the step to implement Recipient Filtering in Exchange to avoid SMTP Queue Length errors and protect against a Reverse NDR Spam Attack. 2008-03-24: Added IE 7 for Server 2003 download link and install recommendation. Also added the link to SyncToy 1.4 to download and install. 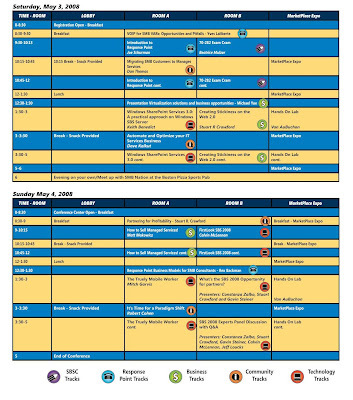 2008-04-21: DHCP credentials required, SQL SP2 references, ISA not installing on more than 4 cores, and IIS setting for Companyweb. 2008-08-11: Added the note that WSUS v2 should be synchronized prior to WSUS v3 being installed. 2009-08-26: Added the option to allow users to change their password in OWA.